Got what I wanted! The quality of results for most of my picture-taking is a function of luck since I don’t spend any time on technical details, choosing instead to settle for whatever the “auto” setting conjures. 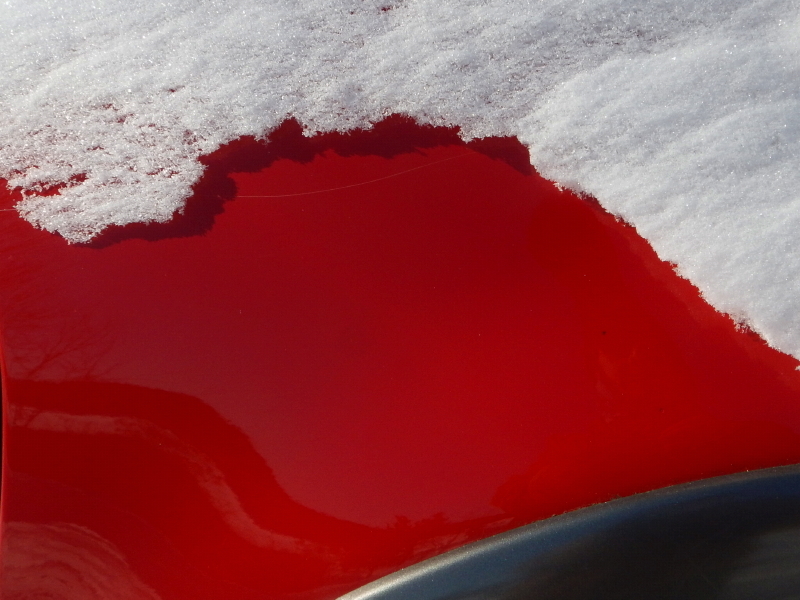 On Sunday, the combination of sun, snow, shadow, red paint, and reflection caught my eye. If you look close, I even got a selfie out of the deal. I love how the snow looks so much like paper or felt. The roll of the lower left reflection that flows similar to the broken edge of the snow. The compliment of the contrasting black trim. How the shadow reveals the space between the snow and truck surface. Most of all, I like that the camera actually captured what intrigued me enough to take this picture. All too often, I don’t even bother pulling out the camera when scenes around here are too big for a photo to do proper justice. Nothing works as well at interpreting a complete landscape as a pair of eyes perceiving it in real-time. For my vague impressionistic compositions, the little point-and-shoot I use has provided me with enough lucky outcomes to keep me giving it a go. Every once in a while, I get a satisfying reward. If you hadn’t written that the white was snow I would never have figured it out.